We offer residential homes and commercial businesses in Carroll County MD top quality hardwood flooring installation by some of the best wood floor manufacturers including Lauzon, Mullican Flooring, Bruce Hardwood Floors, Chelsea Plank Flooring, Aacer, Tergren, Plank Floor. 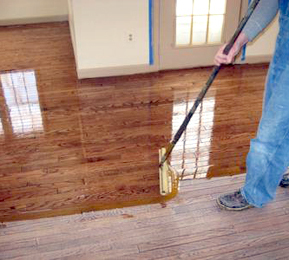 We specialize in hardwood flooring installations and hardwood floor refinishing including sanding, staining and finishing in all rooms of house including dining rooms, kitchens, foyers, family rooms, bathrooms, basements, bedrooms and steps. Our professional flooring contractors service all of Carroll County Maryland including Finksburg MD, Marriottsville Maryland, Hampstead, Mount Airy, Mt Airy, Winfield Maryland, Sykesville, Woodbine, Eldersburg, Taneytown MD, Taylorsville, Manchester, Union Bridge, Westminster and New Windsor. Types of unfinished or prefinished wood available for purchase and installation include: Brazilian (jatoba) Cherry, Spotted Gum, Brazilian Walnut, Brazilian Teak, Purpleheart, Bubinga, Mesquite, Merbau, Jarrah, Hickory, Pecan, Wenge, Brazilian Maple, Sapele, Hard Maple, Southern Yellow Pine, Australian Cypress, Tasmanian Oak, White Ash, Sydney Blue Gum, Beech, Northern Red Oak, Birch, Iroko, Pine, White Oak, Mahogany, Thai / Burmese Teak, Padauk, American Black Walnut, Black Cherry, Douglas Fir, Distressed, Antique, Cork, Green Flooring Products, Bamboo, Recycled wood planks, and more.